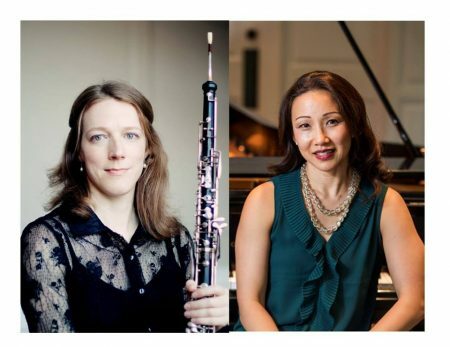 Randolph College’s first Guest Artist Recital of the 2018-19 academic year will feature Monica Fosnaugh, English hornist for the Detroit Symphony Orchestra (DSO), and Emily Yap Chua, a renowned pianist and Randolph music professor. The event, which is free and open to the public, is scheduled Friday, August 31 at 7:30 p.m. in Wimberly Recital Hall. Fosnaugh will play both English horn and oboe for the concert, which will include works by Bach, Debussy, Beethoven, and Cleveland-based composer Margaret Griebling-Haigh. “The Detroit Symphony Orchestra is one of the oldest and most storied orchestras in the country, and we are extremely fortunate to have a musician of Ms. Fosnaugh’s caliber in the Guest Artist Series at Randolph College,” Chua said. Fosnaugh’s performances have been praised as “gorgeous” (Boulder Daily Camera), “supple” (Detroit Free Press), and “lyrical and sublime” (Detroit News). She has been a member of the DSO since 2012, and previously held positions with the New Haven Symphony, the Syracuse Symphony, the Rochester Philharmonic, and the Kalamazoo Symphony Orchestra. She was also an oboe fellow at the New World Symphony Orchestra in Miami Beach, where she worked under the baton of Michael Tilson Thomas. She has also been featured as a soloist with the DSO, performing works by Aaron Copland and Leonard Slatkin. Chua made her international solo debut at the Cultural Center of the Philippines in Manila, where she was described as “remarkably passionate… vividly enchanting,” (The Daily Tribune) and a “vibrant, spirited, and movingly expressive” performance. (The Philippine STAR). An active soloist and chamber musician, her collaborations include performances with musicians of orchestras and institutions around the world, including members of the Cincinnati, San Francisco, Detroit, Nashville, Charlotte, and Virginia Symphony Orchestras. Most recently, she performed alongside tenor David Tayloe at the National Opera Center at Opera America in New York City.